What can I say? I’m in sock mode. But it’s a good thing. It’s summer after all. No one wants a big honking sweater in their lap when it’s hot. I really like these. The pattern is mine. I have been trying to write it down as I’m knitting. I found a note pad app for my Kindle Fire. My son gave it to me for Christmas. I love to read and all the extras make it so useful. I take it almost everywhere with me. It fits into most of my purses. What more do I need? I realize that the purple stripes are hard to see. I’ll try to take a better picture. 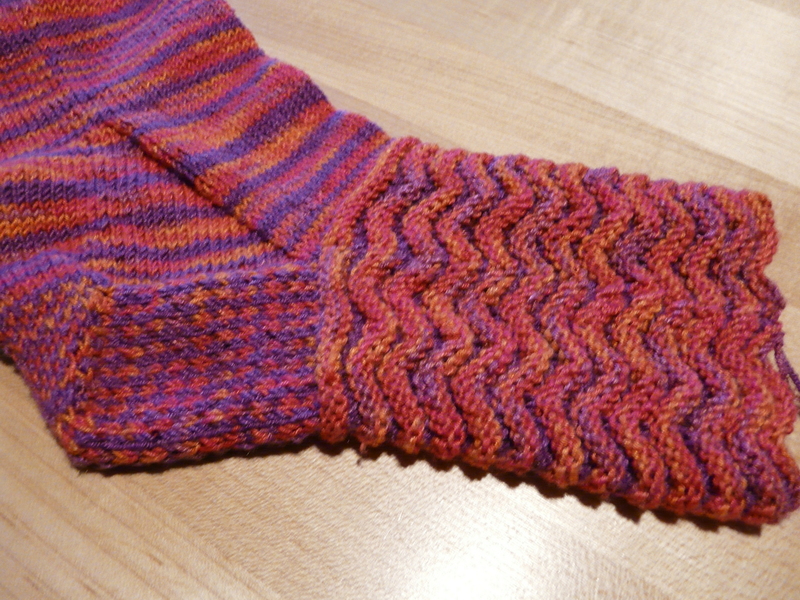 The heel looks great. I did a little checkerboard on the bottom. The pattern will be up as soon as I fine tune it. This entry was posted on July 9, 2013 at 5:49 pm and is filed under Knitting. You can follow any responses to this entry through the RSS 2.0 feed. Both comments and pings are currently closed. Wow – they are lovely! Thanks so much, Snail. The pattern should be up soon.